It is the beginning of October. One year and two weeks ago I started skating for the first time many many years. I attended my league’s free skate called “Wednesday Skate” because it’s on a Wednesday! On that first day I was wobbly and unfit. I had to use the building furniture to help me get up on to my skates. After three laps I needed a rest. In the WFTDA minimum skills there is a requirement to skate 27 laps in 5 minutes. I couldn’t skate for five minutes period over the next four weeks I got a little bit better. One year ago less two weeks I started with Leeds Roller Dolls’ recreational league. The first few months were slow progress. For my first ever 27 laps in 5 minutes I managed 11 laps but I did skate for a whole 5 minutes. Gradually I got a little better. One thing that did come relatively quickly was my basic agility. At the beginning of February I took my first WFTDA minimum skills test. I failed almost everything but to my surprised did pass a few things. Laterals (weaving from one side of the track to the other) and glides (travelling around half the track on one foot) were two of them. It was around this time I was brave and bought a ticket to pre-minimum skills boot camp in Sheffield. It was a five hour bootcamp. I really wasn’t sure if I would survive five hours but I did. 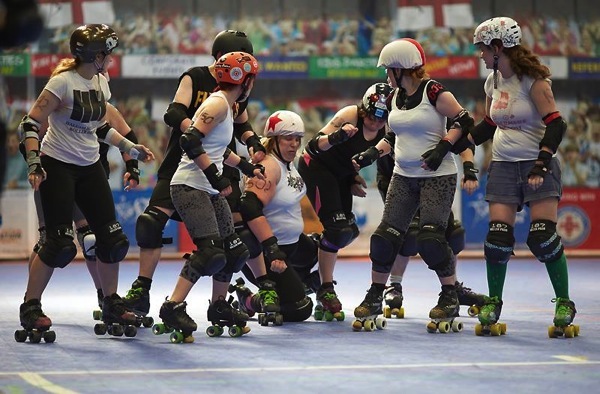 The trainers also assessed us and considered most of us good enough to scrimmage (play a roller derby game). I even jammed. Also at the beginning of the year I decided I would try and learn to run. I started couch to 5K which is a training plan to get you from a non running to running 5Km within 10 weeks. I have to say I still can’t run the full 5Km non stop but I can run, walk, run, walk my way around. 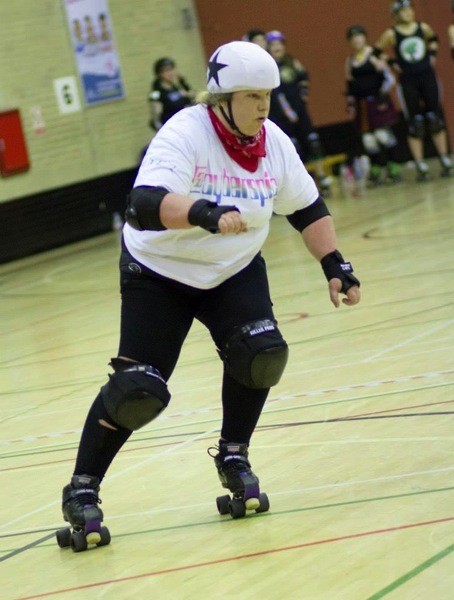 In June my own league, Leeds Roller Dolls, ran a pre-minimum skills boot camp itself so I had to go. This one was six hours long. Again I thought I was going to die but I survived again. And again at the end there was a scrimmage. Again I jammed. Again I wasn’t very good at it. Its interesting to see photos of me over the last year. As you can see I’m slimmer in the second photo compared to the first. When I started derby I was a size 26/28. I am now a 20/22. I am also a lot lot fitter. Well the weight loss is going slower than I would like but this is partly because I am building so much muscle. However I have lost 10kg which is almost 2 stone. So I’m starting to get there. I smashed this. On June 14 I ran the Race for Life for Cancer Research. It is a 5K walk, jog or run. Due to bad planning on my part I ran this a day after the six hour roller derby boot camp. Despite that I still managed it in 44 minutes. That’s 6 minutes under my target. If I’m going to do this I need to start running again. My current problem is fitting everything in. I need rest days. I could probably walk it without a problem so I need to just get on and do it. At the end of November / beginning of December I will be assessed on my WFTDA minimum skills again. As I’ve said I don’t think I’ll pass everything but I do expect to pass quite a few skills. My aim, however, is to pass them all by the middle of next year. I think this is achievable! This entry was posted on Saturday, October 4th, 2014 at 11:16 am	and is filed under Roller Derby. You can follow any responses to this entry through the RSS 2.0 feed. You can leave a response, or trackback from your own site.